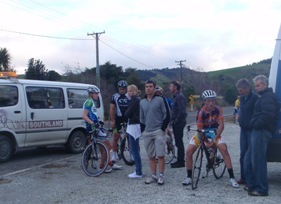 15/05/10 - This Catlins race was a first for the Cycling Southland road racing calendar. Overcast but dry conditions were ideal for the handicapped event, 47 riders set off in five groups from the Niagara Falls café. It was a 40min gap from the limit to scratch bunch that tested everyone to their limit. The race itself was "tough" after a flat 5km warm up it was into the first of many hills. It's a race where the stronger riders excelled, if you couldn't climb or descend fast you were always going to be struggling. Cameron Karwowski, Pieter Bulling and Marcel Baird (scratch) showed their strength and almost caught the limit bunch. Tim Maynard and Dave Simpson (limit) attacked on the first hill and worked well together to stay away for the rest of the race. New rider Mat Dodds (2nd limit) proved he is going to be someone to watch and rode well to place well in the top ten. Comments following the race were very positive; it's a race that will definitely be on the calendar in the future. 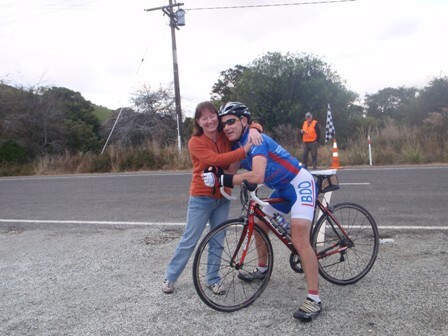 Support from local businesses was very much appreciated, Amanda from Niagara Falls Café turned on free coffee and cakes to refuel the riders after the race and other local company's provided generous spot prizes.